The toddler market stall is a group role play unit designed specifically for 18 months and above in an early learning setting. 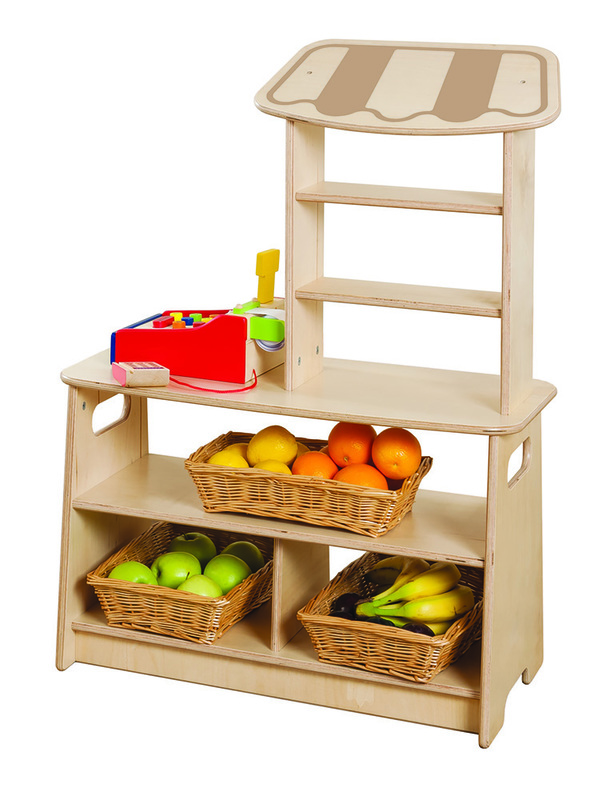 The market stall unit features multiple shelves for storage of role play toys, a reversible roof with printed or natural wood side, as well as convenient carry handles for easy storage and transport. Designed to create a safe play environment, the market stall is manufactured sustainably in the UK using high quality birch plywood with rounded corners, tactile edges and finished with a child-friendly, water-based lacquer to maintain the natural wood appearance. All units in the toddler kitchen and market stall range are delivered ready assembled with a 5 year guarantee. Please note: the till and baskets featured in the product images are not included with the Toddler Market Stall. For more information please Contact Us or call us on 01733 511121.